Alex Zanardi: 2x CART Champion, Paralympic Gold Medalist! 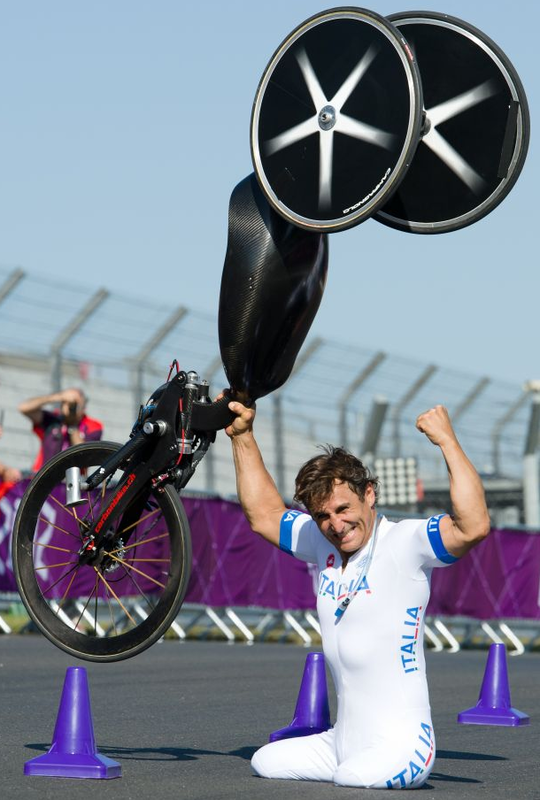 If you haven’t heard by now, former 2x CART Champion and ex-F1 racer Alex Zanardi took gold in his Individual Time Trial at Hand Cycling in the 2012 London Paralympics today. If you don’t know who he is, read up and prepare to be truly inspired. The words ‘hero’ and ‘legend’ don’t event begin to describe him. He is no doubt one of the most incredible examples of what a person can accomplish when they believe that their limits are endless, and when they believe in themselves. He’s, needless to say, a huge personal hero of mine. And I got to meet him at SEMA in 2007, which was an amazing experience! Motorsport legend. 2x CART champion. Superman incarnate…..and a much less successful driver. He signed my copy of his book My Sweetest Victory (which is great, BTW. Pick it up and read it!) as well, which i’ll treasure. The man is 45 and still will never give up on living his life to the max, truly an inspiration. And now he’s apparently talking with Chip Ganassi and Jimmy Vasser about racing in the 2013 Indy 500 (which is one event he never raced in)….how cool would that be? !